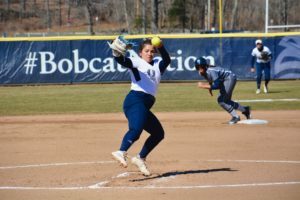 With Sunday’s matchup having to be rescheduled due to rain, the Quinnipiac softball team (9-18 overall, 4-0 MAAC) wasn’t affected as they swept MAAC rival Saint Peter’s (3-22 overall, 0-2 MAAC) 3-1 and 5-4 in doubleheader action on Monday. In the first game, not much action happened in the beginning for either team. In the third inning, Quinnipiac senior outfielder Erin Lauren singled, driving in two runs to make it 2-0. Then, in the fifth inning, Quinnipiac junior infielder Rachel Marchuk hit her first home run of the season to make it 3-0. 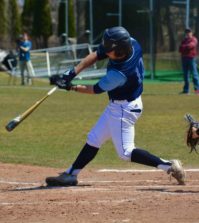 Saint Peter’s would score one run in the seventh inning but it was too little too late as Quinnipiac won the game 3-1. The second game had a different start to it than the first in terms of getting on the board. In just the first inning, Saint Peter’s came in hot getting up on Quinnipiac 3-0 while Quinnipiac had no response in the first. At the start of the second inning, Quinnipiac switched pitchers, taking out freshman Brooklyn Maguire and putting in freshman Lauren King. King was lights out in the second and gave Quinnipiac some momentum going up to bat later in the inning, putting up two runs to make it a close one-run game. Quinnipiac would end up tying the game at three a piece. 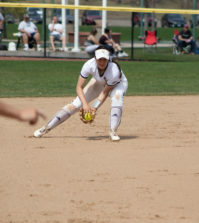 Quinnipiac eventually took the lead as a result of a fielder’s choice that had freshman infielder Bridget Nasir score. After the umpires reviewed, they ruled that Larsen was out on third and Nasir scored on a fielder’s choice. King who pitched perfectly until the sixth when Saint Peter’s tied the game at four off a single by freshman infielder Alyssa Mido, leaving a runner in scoring position. That is when King came off the mound and senior Kendall Brundrett came in to get Quinnipiac out of the jam. Both teams’ pitching and defense were on fire from that point on, letting up no runs and getting out of jams, until it was Quinnipiac’s turn to bat in the 10th inning. 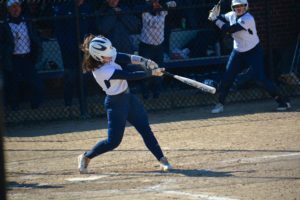 With the bases loaded after Saint Peter’s gave up a single and a couple of walks, it was junior outfielder Megan Dyson who would decide the fate of the game with two outs. Dyson got hit by a pitch that would drive in the game winning run and Quinnipiac would win 5-4 in 10 innings. 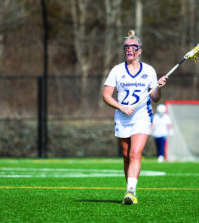 Quinnipiac improves its win streak to four games and remains undefeated in MAAC play this year at 4-0. The Bobcats will look to keep the streak alive as they head to New Haven to take on Yale in doubleheader action with the first game starting at 2 p.m. on April 3.